Zip file recovery, download and trial best free software to recover lost deleted formatted zip files from hard drive, disk , memory card and more. Aidfile Recovery software is a powerful data recovery tool for recovering zip files from deleted / formatted / repartition / missing drives / partition table damaged etc. It supports FAT32 / NTFS / EXFAT etc file systems. Use "Undelete" mode to recover deleted zip files. Use "Unformat" mode to recover lost zip files after format hard drive. Use "Recover partition" mode to recover zip files if partitions changed or damaged or deleted. Use "Full Scan" mode to recover deleted zip files which can not be found with "undelete" and "unformat" and "recover partition",recover zip from raw partition,recover the zip files of partitons which are not NTFS,nor exfat,nor fat32 Support deep and full scan lost zip from partition , hard drive, usb. completely recover all zip from hard drive. Why zip file is missing we need recover lost zip files ? Sometimes one of the most usual error messages to appear is the corrupt file message and this can even occur to ZIP files, when this happens you need some Zip repair software to recover the corrupted file so it can be opened again. But sometimes Zip files can be lost in unconsciously situations such as unintentionally deleting, operating system corruption, hard drive formatting; virus infection, partition loss, etc. It is quite easy to restore the documents to its original location within one or two simple clicks when you find it still in the Recycle Bin. If the document is not there, the ZIP recovery software is the best savior to help you retrieve these significant Zip files rather than the long-waiting and complicated manual data recovery. How to recover lost deleted or formatted ZIP files ? Aidfile Recovery software is powerful ZIP document data recovery tool to retrieve the document you want safely and easily. With its abundant functions, it can also recover deleted, lost, damaged and formatted data from hard drive or partition. Even if you have written new data into that hard drive or partition, Aidfile Recovery software still find its directory tree from hard drive. When ZIP file had been deleted or lost from your hard drive , disk , memory card, and more. its contents aren't immediately destroyed. If you use an undelete process before Windows uses that part of the memory card to write a new file,you can recover your deleted or lost zip files. Download Aidfile Recovery and install it to your computer following the instruction. Launch aidfile recovery software from Start menu. 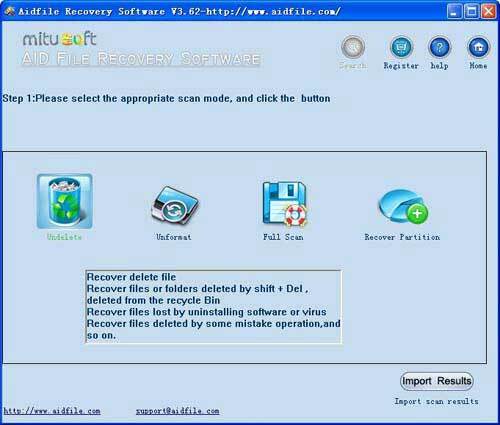 following aidfile recover software so it is very easy to use. After you click Next, Aidfile will begin to Full and automatic scan and find out your lost ZIP files. After the scan completes, will show all the files can be restored. You can select the needed file and save them. Select the"Recover Partition " or "unformat" or "undelete" or "full scan" to recover zip files. ZIP common name, is a high storage density of disk drives and disk, a ZIP disk capacity of about 100MB , is a computer file compression algorithm, formerly known as Deflate, inventor of the Phil Katz. ZIP is commonly used suffix ". Zip", its MIME format application / zip. Currently, ZIP format compression format is one of several mainstream, its competitors, including RAR format, and the open source 7-Zip format. From the performance comparison, RAR compression format is higher than the ZIP format, but the 7-Zip provides compression tools free of charge gradually be applied in more fields. WinMount can mount ZIP virtual disk, without decompression, random read, this is another great innovation. ZIP, a powerful and easy to use compression formats, support for ZIP, CAB, TAR, GZIP, MIME, and more compressed file format. Its characteristics are closely drop with Windows Explorer integration, do not stay open Explorer The compression / decompression. including the self-extracting WinZip WinZip Wizard and personal version control.